Your deck has been with you through thick and thin. It has seen its fair share of barbecues, thumping from the kids and pets, and brutal weather. But over time, dirt, debris, and wear and tear can take a toll on your deck, causing it to look dull and faded. If your faithful foundation is starting to lose its luster, spark joy again with deck resurfacing. Scorching UV rays, blistering winds, and torrential downpours—the weather can wreak havoc on your deck. The harsh conditions can not only affect the look of your deck, but also cause major damage to the wooden planks. With deck resurfacing, you can up the weather resistant factor, protecting your deck from the elements. You lead a busy lifestyle. The last thing any homeowner wants to do is waste a Sunday afternoon on deck upkeep duties. Resurfacing your deck means not having to worry about time-consuming cleanups. Your newly refinished deck will be impervious to stains and spills. With a simple wipe, you can get on with the rest of your day. Deck resurfacing material needs to be tough to handle the rainy West Coast. The waterproofing membrane we use is made from polyurethane—a material so tough, it is used to make tires for mining trucks. So, if our polyurethane can handle the roughest terrain while hauling 350 tons of ore, it can take on anything you or Mother Nature can throw at it. With deck resurfacing, there’s no need to remove the existing deck membrane. A deck pro will coat over your deck with the polyurethane material, leaving behind a seamless, waterproof foundation, without the need for reconstruction or deck replacement. Home renovations can be expensive—but boosting your property’s curb appeal doesn’t have to cost you and arm and a leg. A stunningly resurfaced deck is an affordable way to breathe new life into your home, without breaking the bank. In no time at all, you will have a shiny, new deck that will add heaps of beauty and functionality to your house for years to come. Have you lost that loving feeling for your deck? Getting it resurfaced will have you falling in love with your deck and the outdoors all over again. Reap the benefits and spark joy again with deck resurfacing from NewPort Dry Deck! 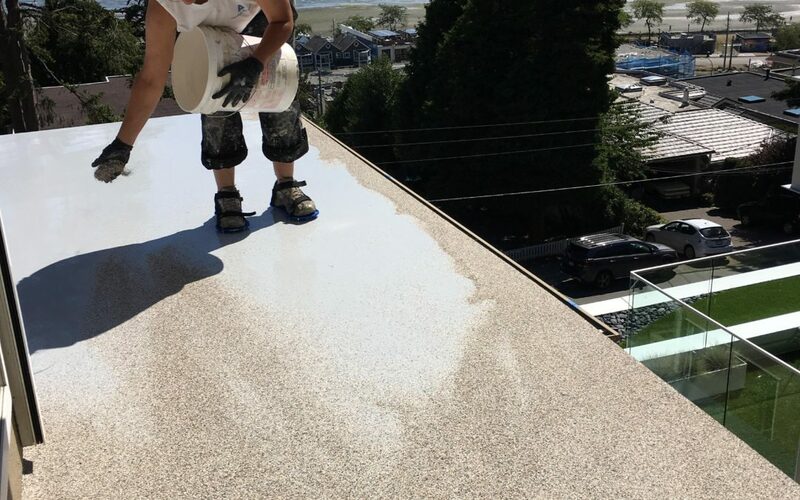 Contact NewPort Dry Deck to learn more about deck resurfacing in the lower mainland!